There are two baked goods that I have enjoyed in my lifetime that seem to be lost forever. One was a cookie and one was a sweet loaf. I have tried to re-create both, unsuccessfully, which makes me quite sad. The first one was a peanut butter cookie. Seems simple enough, right? It was 1973 and every weekend, during the spring and fall, my Mom would drive me out to Long Island to take a horseback riding lesson on Saturday mornings. Every year or so she would find a new stable for me to try. I don’t know why we kept changing; each one had something else to offer. At this particular time, I took my lessons at Old Mill Farm, in Jericho, NY. This was a most fabulous place and my favorite of all. The horses were very well kept and the grounds were absolutely gorgeous. The rings were flat and well tended. There was a grass lined ring way in the back at the edge of the woods that held the fancily painted large jumps. There were miles of trails; and then there were the lucky people who owned their own horses and boarded them there. They could ride whenever they liked and stored their handsome leather saddles and bridles in the tack room. I loved the way that room smelled. I would never own a horse. I came but once a week, took a 1-hour lesson, and that was it. There was a room in the barn beyond the tack room that functioned as a waiting room. There were some chairs to sit upon and it was here that I would wait for my instructor to finish up with their prior lessons and come summon me and the other children. One day, I walked into the waiting room and there was a small dish on a low table filled with what were obviously peanut butter cookies. I knew this because they had the telltale criss-cross hatch marks on them, and they were the right color, size and shape. There was a woman standing beside the table that I had never seen before. Her dark chocolate colored skin contrasted highly with the starch white apron she wore. I remember the apron was edged in lace. I thought I was looking at someone out of Gone with the Wind. “Help yourself to a cookie, darlin,” she said in a motherly way. I had no idea where she had come from. It looked like she was the maid or caretaker of a home nearby. Perhaps there was a main house I had never noticed. Who owned this place anyway? I thought about all these things for a brief moment. The cookies were calling my name. 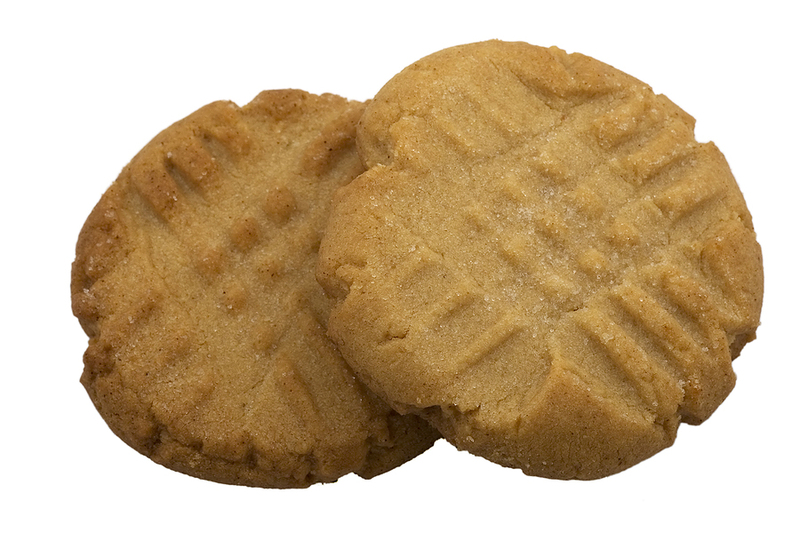 I chose a cookie and the unmistakable peanut butter aroma hit my nose a few seconds before the cookie entered my mouth. I bit down. It was firm, but not hard. The piece gave way and I began to chew. It was crumbly and chewy and the same time. There was this exquisite sandy texture that I had never experienced in a peanut butter cookie before, at least not to this degree. Was I tasting brown sugar and white? Did I detect a hint of salt and a dash of vanilla? The peanut butter flavor filled my mouth. The texture was divine. The flavor was rich and full and satisfying. Every peanut butter cookie up until that point had been but a training ground for my taste buds. Little did I know that I would never have such a peanut butter cookie again, but I haven’t given up searching. Jump to 1980 and I was at Hampshire College, living in an on-campus apartment with about seven other people. I say about because my boyfriend Kevin wasn’t legally living with us, so his “room” was really the storeroom. In fact, he lived in my room. We had a two-floor apartment and on the first floor were just two of the bedrooms. Sam had the one closest to the kitchen and Peter had the other. Peter had curly blond hair and if I remember correctly was athletic, or at least seemed that way. One day he received a care package. It might have been his Mom or sister who sent it, or perhaps a long-distance girlfriend. I don’t know for sure. All I know is that it was a loaf shaped carrot cake and he offered me a slice. My mouth woke up with a start. If someone gives you carrot cake, you think you know what you are getting. But this was a surprise. There were shredded carrots, and it was moist with brown sugar and it had that edge of baking soda, but it had nuts, and raisins, and coconut and – wait for it – poppyseeds all in one loaf. It was a delectable combination that I never would have thought of myself. I loved it. I wanted more of it. It seemed to satisfy every flavor receptor in my mouth. And the texture was exciting as well. The coconut added a chewy component but it was the poppyseeds that were so unexpected. You wouldn’t hit one with every bite, but when your teeth came down on one it was an exciting unexpected textural treat. They also added a nutty flavor that was very different from the chopped pecans and very welcomed indeed. Over the years I have tried to re-create both of these items, to no avail. Oh I have baked up batches of good peanut butter cookies, and loaf after loaf of embellished carrot cake, but I have never hit the heights that I remembered. These were my Proust madeleines. It frustrates me to no end, knowing I will never again have these to enjoy. Or, will I? Now that I have published this story, if you have any remembrance of either of these, any idea of who the original bakers were, please let me know.